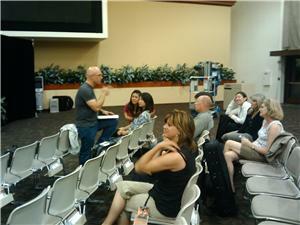 during the Saddleback Worship Conference, 2009. 10:58 PM: LeAnnThomas Time to get packin! 8:30 AM: Davehopkins111 Just arrived in So-Cal 2:30 am Its my Birthday ..down south with my homies see you at the conference come join me!! Saddleback all week! 1:24 PM: RussHutto Russ in the house! How’s everyone doing. 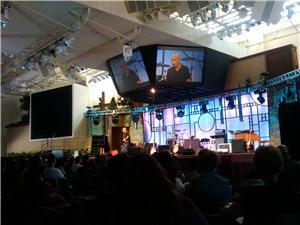 1:30 PM: RussHutto Live blogging happening from the Saddleback Worship Conference #sbwc09. 1:52 PM: keysoffaith I’m physically in central California this morning but my heart is at Saddleback for the Worship Leader Conference. Praying it’s awesome! 3:06 PM: kylecleveland Staff Retreat ’09… Saddleback does it up right! Buffet breakfast, now sprawling pools and warm sun. 3:06 PM: GregAtkinson At the airport TGIFriday’s. I forgot to mention @Jonathanmoon is going with me to Saddleback. Looking forward to seeing @brentonbrown. 4:07 PM: physicsprof RT @lorijo9: Does anyone know what the saddleback worship conf cost is for 1 day? I have Fri off would love 2 come…? no info on web -help? 4:54 PM: bkwestman This will be my first time not at the #sbwc09 conference. I’ve been able to go every other year, but we coudn’t make it this time. Have fun! 5:10 PM: Barry Westman This is my first year that I’ve missed the Saddleback Worship Conference! I’ve been to all the ones before this, but we weren’t able to make it this year. I’m sure all you guys will have a wonderful time! We are going to the NWLC in KC, though! 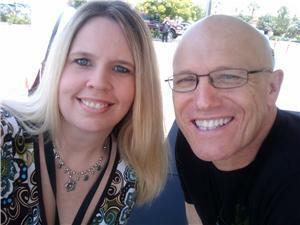 5:11 PM: Lori Biddle great morning with Rick Muchow – always so encouraging! Saddleback is so blessed to have him. 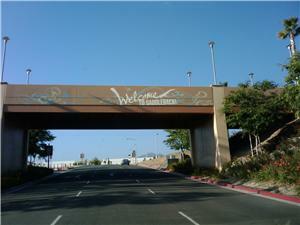 Now on my way over to Saddleback for early registration. Anyone else heading over this afternoon? 7:08 PM: Lori Biddle We are in! How exciting! 7:10 PM: Lori Biddle The picture I am uploading is taken of the tables that are set up for us to blog from in the Saddleback Auditorium! 7:12 PM: theworshipcomm Lori – welcome! Look forward to some cool updates – thanks for uploading the pics! Did you see any “TheWorshipCommunity.Com” postcards out there? 7:13 PM: Lori Biddle We just finished meeting with the main Tech guy for the conference making sure we were all hooked up to communicate with TheWorshipCommunity! 9:20 PM: Lori Biddle Hey everyone, they want questions from you…anything you’d like to know about Saddleback or their systems, staff, or anything else you would like to know. If they choose our questions they will use them during the main sessions and answer them. Or, better yet, if you have a question that can be posted asking for a vote of some kind, or everyone’s opinions – they will allow live texting on the screens to respond to your question or opinion. So please email them to me at Lori.Biddle@crossroadswired.com Please send them as soon as you can! Thanks! 9:20 PM: Jn17jules @loswhit You’re going to Saddleback? Our worship leader is there too- we’re in So Cal- and I’m pet sitting 4 her! Hope u have a great time! 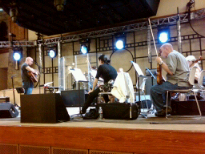 11:08 PM: Lori Biddle I’m watching Rick Muchow leading a rehearsal for the worship conference! I just talked to the guy leaving to pick Steve Fee! Sweet! 11:10 PM: Lori Biddle Guess they are bringing Steve Fee straight to the Saddleback auditorium from the airport to rehearse also! 7:21 AM: i61Lee Wish I could be at the Saddleback worship conference. I’m so envious. What are the best conferences in the UK? Any recommendations? 7:21 AM: jaredwells @WyattJohnston Ah, thanks for the kind words. 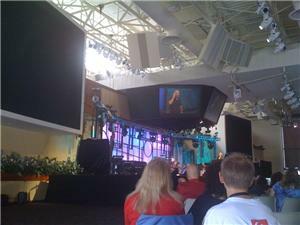 I’m doing monitors at Saddleback for the conference all week. Always fun!! 9:47 AM: Lori Biddle Good morning everyone! Looking forward to a great day at Saddleback! As I woke up this morning I began to pray and emotion overwhelmed me already. When you serve and serve and sever at every single service in your ministry you become tired. It becomes an effort to prepare your heart to receive God’s Word because there is always one more detail…today the details are not ours and we have the opportunity to just absorb God. 11:31 AM: loswhit If you are at Saddleback Worship Conference this week follow @saddlebackwc09 and use #sbwc09 as the hashtag. 11:59 AM: Lori Biddle We are in before the crowds have been allowed, so having a blast watching rehearsal! It is going to rock!!! 11:59 AM: Lori Biddle The brass rocks!!! 12:03 PM: Lori Biddle Tim Davis is an amazing vocalist! Wow, this is going to be such a blessing! People are lining up outside and very anxious to get it, they have no idea what they are about to experience…fantastic! 12:13 PM: brookjames Anyone have an extra pass to the Saddleback Worship Conference? Help a poor worship pastor out! 12:13 PM: tomsmith500 CA // DAY 5 – Saddleback Conference is here. 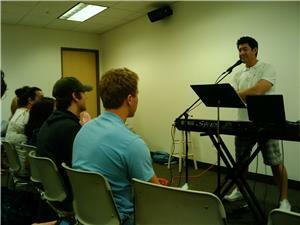 Big day of teaching n worship. Got my notepad ready to capture something inspiring. 12:44 PM: Lori Biddle Crazy preparations in the video booth! 12:44 PM: Lori Biddle Bobby Barton – hilarious opening!! 12:55 PM: theworshipcomm Welcome to the Live Blog/Twitter Feed, live from the Saddleback Worship Conference – Live Feed will begin at Conference Open, Wed AM. Attending? Leave a comment and let us know! 1:06 PM: theworshipcomm Wow – did you hear that, they do 32 services per weekend at Saddleback! 1:06 PM: samdejong A beautiful crisp morning in the OC… Just arrived at Saddleback about to set up outdoors, and listening to some blistering 90s solos!!! 1:06 PM: Penny Wow, there are a lot of middle aged white people on that stage. 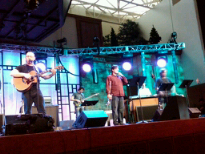 1:13 PM: LeAnnThomas http://twitpic.com/8ah6b I’ll be live blogging all day for @theworshipcommunity at the Saddleback Worship Conf. WOW..Amazing musicianship! 1:16 PM: theworshipcomm Francis Chan now on the stage! 2:24 PM: theworshipcomm Steve Fee taking the stage – please join in the conversation – click “Make Comment” above and we’ll get your thoughts into the live stream! 2:26 PM: theworshipcomm OH MAN — I love this song, “Glory to God” by Steve Fee. 2:47 PM: PhilCooke At Saddleback. Ready to teach at the worship conferrence. Francis Chan just finished. 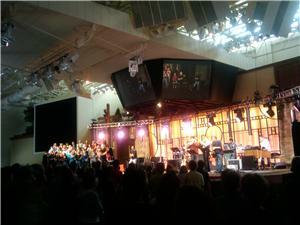 2:47 PM: brettcrimmel The Saddleback Worship Conference is online and Fee Band is leading worship. I love technology! 2:47 PM: vickybeeching If you are in the OC or LA area, come worship with me, brenton brown and tim hughes tonight at saddleback..starts at 8pm! 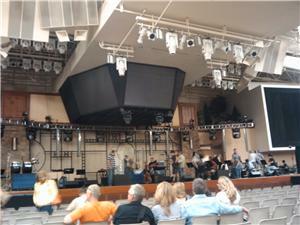 2:47 PM: vickybeeching Gettin ready for today at Saddleback… lots going on! Meeting w/Worship Leader Mag, Conversant Life interview, playing twice…will be fun. 3:34 PM: GregAtkinson About to teach on innovation at Saddleback. 3:34 PM: LeAnnThomas http://twitpic.com/8ax4e Me & Rick Muchow @lunch #sbwc09 I was still a lttle teary eyed from the Fee worship. 3:49 PM: jaredwells RT @bweston: Showing off ProPresenter and PVP at the Saddleback Worship Conference #sbwc09 this week. Please stop by and say hello! 3:58 PM: jasonshafer Come see ne in tent 3 if your at #sbwc09!!! 5:19 PM: chaseparker007 #sbwc09 awesome!! Fee is gonna be great later today! 7:20 PM: Lori Biddle Wow! Concert! Fee! 7:26 PM: Lori Biddle Set change, Fee is done, Rick Muchow is up – telecast is about to begin!!! 7:29 PM: Lori Biddle Road to Recovery is being lead by Rick Muchow…here we go live! 7:33 PM: Lori Biddle My church is watching! How cool! 7:40 PM: Steve Hello from Crossroads in Mansfield, Ohio! 7:45 PM: Lori Biddle Any CCN satellite churches our there? How does the feed look? 7:51 PM: Steve looks good in Mansfield, only we broadcast in 16.9 and its coming in squeezed. 7:53 PM: Steve it was cool to see the people worshiping here! 8:01 PM: Lori Biddle Pastor Rick says, “All lasting change begins with our choices.” How true! 8:37 PM: Steve is anyone watching besides me? 8:37 PM: Steve so many people here from Celebrate Recovery but he’s talking to all of us. We don’t want to face the truth. 9:00 PM: Lori Biddle Saddleback will be making availabe everything the local church needs to offer the ‘Life’s Healing Choices’ campaign. They always make it easy for even the smallest ministry to receive great affordable resources! Should be exciting this Fall! 9:02 PM: Lori Biddle Off to dinner we go, I will check in later! 1:32 PM: brettesslinger watching the Saddleback Worship Conference live stream… Sarah Kelly is leading worship right now! 1:33 PM: CopyrightSolver Coming home to OC & Saddleback Worship Conference. My copyright class is 3:30-5:00 today…come join me (the Copyright Queen). 2:19 PM: Lori Biddle Oh my goodness, Carlos is in the house!!! 2:23 PM: hebessica #sbwc09 This video is hilarious. As someone who has had to run sound & lead worship simultaneously this just makes me laugh my face off. 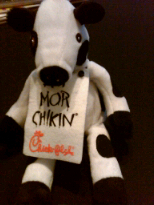 2:25 PM: Lori Biddle Dan Cathey, CEO from Chick-fil-A is up, great testimony! He says, “You get bigger, by getting better!” How true! 2:35 PM: Lori Biddle creating raving fans: Operational Excellence; 2nd Mile service; Emotional Connections If you use this strategy – you will not need ‘air time for advertising. strategy that can easily apply to the church! 2:53 PM: hebessica #sbwc09 If I didn’t absolutely adore Chil-fil-A before, I’m smitten, now. Dan Cathy is the man. 3:00 PM: hebessica #sbwc09 This story is grace in action. This is what God has done for us. standing ovation for Dan! well deserved! 4:44 PM: hebessica #sbwc09 Are they planning on archiving that video of Dan Cathy? Our server went out for most of it & I really want to hear the whole thing. 4:44 PM: GregAtkinson About to teach on Web 2.0 at Saddleback. 6:03 PM: CWmedia @dancathy Thanks for the 2nd mile talk from Saddleback Worship Conference today. 6:47 PM: Lori Biddle We just sneaked into the auditorium where they are doing a sound check on Isreal Houghton…I can tell you he is going to bring the house down! 8:20 PM: Lori Biddle Outstanding Q & A workshop with Rick Muchow! Great, great day! 10:29 PM: Lori Biddle Gospel praise is so sweet! 10:30 PM: Steve at Crossroads Sneaking into the auditorium…must be an ongoing Crossroads tradition! 10:30 PM: Steve at Crossroads We are watching and waiting for Lori’s outstanding report when she gets back! 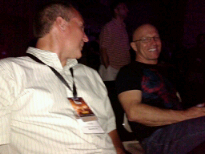 11:26 PM: Lori Biddle My hubby and Rick Muchow watching Israel Houghton! Israel is performing “You Are Good” one of our churches favorites!! Amazing!! 11:58 PM: Lori Biddle Great tech here for sure. The lights are just one of many outstanding things! God is glorified in excellence! 12:33 AM: Lori Biddle See you back at 8:30 in the morning! 8:17 AM: quimbulus great day. saddleback was awesome. finally gonna get some sleep..then family time tomorrow. 12:54 PM: Lori Biddle Pastor Rick is teaching right now, of course it’s amazing. He is saying the “purpose driven book” is in the Guinness book of records. When the book hit the stands and became the best selling book for 3 years! Annointed! All of a sudden Rick was getting invited to speak to kings, presidents and even other religous leaders. Despite all of this he has only one job – “to love his enemies and to speak about Christ and nothing more”…people are often critical of his success. But he has only one focus – spread the gospel! 12:58 PM: Lori Biddle A well known reporter asked him, “what is your salary”. He was able to say he served his church for free for 25 years, because he had returned all of his salary when the book became successful. The reporter didn’t know what to say when he was able to tell her that…she has become a friend of Rick’s through the years. Integrity – wins people over for the Kingdom! 1:03 PM: Lori Biddle The people that loved Jesus were the outcasts. Jesus had no problems with the outcasts only from the religious people of his day. If we have a healthy, effective, life changing ministry – we WILL be criticized by the RELIGIOUS community! (Well, we must be doing something right at Crossroads, because only the ‘formerly churched’ attenders at our ministry are critical, as well as local pastors) Cool! 1:05 PM: Lori Biddle Integrity, humility and generosity are what Pastor Rick asks people to pray for all the time. He encourages us all to pray for that in our lives and in the life of our ministry! 5:20 PM: Lori Biddle Sitting in Carlos Whitakers class right now, I need to learn so much! He’s a great teacher and this is one of the workshops I’ve been looking forward to the most! 5:59 PM: Lori Biddle Kind of working backward but, I also had the privilege earlier this morning to attend Debby Rettino’s Lessons from the Jesus Movement: What we can apply today…this workshop moved my heart. As a panel of guests all described how they were affected by the Jesus movement, they talked in detail about Jesus changing their lives. They talked about how this generation needs a revival and a blessing from our generation, and I found it very, very applicable to our own ministry. This group of old friends created many albums during the Jesus movement and later created the very popular Psalty character that changed another generation. 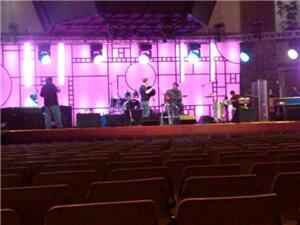 6:53 PM: Lori Biddle The final sound check…sad!! Sheila E and Paul Baloche are both here tonight! Fun! 7:01 PM: Lori Biddle I have a feeling this will be a very impacting service…crosses in place – lives are going to change I know it. 7:43 PM: Lori Biddle Now Paul Baloche is up – great worship! 8:33 PM: Lori Biddle In closing Rick Muchow just asked everyone to write anything that may be holding them back from being fully committed on a card and carry it to the cross. 8:34 PM: Lori Biddle I have enjoyed talking with all of you so much, but must sign off and say goodbye for now. God bless! 8:27 AM: supermatt28 Made it back to @rkweblog ‘s home after #sbwc09 no one home so sad, watching ST: TNG! 8:28 AM: stugio RT @vickybeeching: Everyone at saddleback got one of these…. http://twitpic.com/8ihvh….now we know what evans has lined up!!!!! 8:28 AM: theworshipcomm Worshipers – Click the “Make Comment” link above to add your thoughts to the Live Stream – comments are moderated, but will be approved shortly! Ask Questions for the Saddleback Team as well! 8:29 AM: theworshipcomm Thanks so much for following the LIVE BLOG and TWITTER FEED from TheWorshipCommunity.Com’s coverage of the Saddleback Worship Conference 2009. Be sure and checkout TheWorshipCommunity.Com.